Daimler CEO Dieter Zetsche is all smiles because of strong global demand for the new A class (shown) and its growing family of compact siblings. Daimler CEO Dieter Zetsche's decision to expand Mercedes-Benz's compact lineup from the A class and B class into a five-model range is capturing new customers for the brand -- and at minimal risk of diluting its premium positioning. "We are not only expanding into new segments with models such as the CLA and GLA, but we're also strengthening our top models. 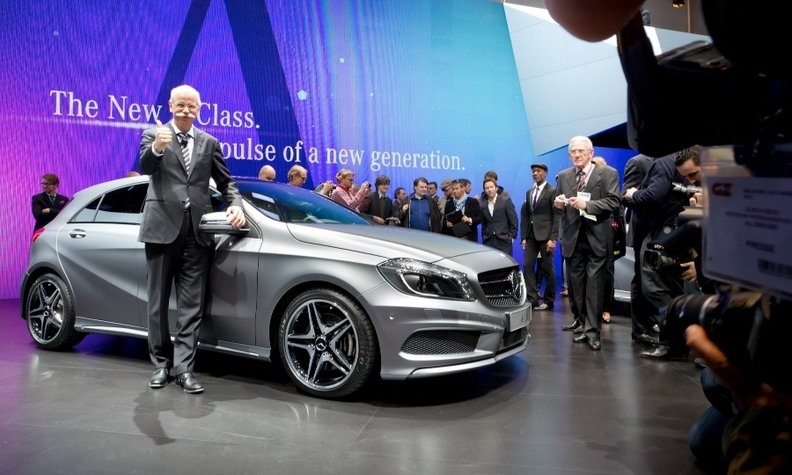 The new S class is by far the best ever," Zetsche said at a media event last month. Bernstein analyst Max Warburton told Automotive News Europe that expanding the compact range is probably a valid strategy for Mercedes. "They need to do it to lower average CO2 emissions for their fleet, but it also indisputable that it's bringing in younger buyers." Warburton is also convinced that that move is "offsetting concerns that the Mercedes is too old." Warburton pointed out that other premium brands have had similar success introducing smaller and cheaper cars. “The Evoque has helped Range Rover seem more trendy, more urban and more youthful, away from the stuffy old image of country living and tweed,” he said. Mercedes has already launched two of its three additional compact models, the coupe-styled CLA sedan and the GLA crossover. The last vehicle to joint the lineup, the CLA Shooting Brake compact wagon, will launch before the end of the year. Demand for the CLA and GLA is booming globally and Zetsche said that several markets are now asking for twice the volume they had forecasted for this year. “Being short of capacity is a nice problem to have, but I’m confident we will soon be able to deliver 450,000 to 500,000 units a year of our new compact range, compared to about 200,000 annual sales of the previous A and B range,” he said. Last year, Mercedes sold 371,399 A- and B-class and CLA vehicles. The GLA and CLA Shooting Brake could help to push this number up to 500,000. Mercedes’ new compact range is key to Zetsche’s goal of overtaking global luxury leader BMW and second-ranked Audi in deliveries by 2020. Mercedes January to April deliveries rose 15 percent to a record 507,353 vehicles, with the new compact range accounting for about a quarter of total volume. Zetsche added that the CLA and GLA are not only helping to boost unit sales, they are also winning new customers from other brands. “Eighty percent of the CLA’s U.S. customers are conquest and, as Mercedes has a high fidelity rate, we hope to keep them loyal to us,” Zetsche said, adding that the aim would be for the new customers to buy larger models such as C class and E class in the future. Mercedes expects the GLA’s global conquest rate to be 70 percent. The Daimler CEO, who also serves as head of the Mercedes-Benz brand, is not worried that the bold design language introduced by the CLA and GLA to attract a younger audience could discourage loyal longtime buyers. “Customers stay young in their heart and soul and I’m sure this [new design] will also please our more mature consumers,” he said.